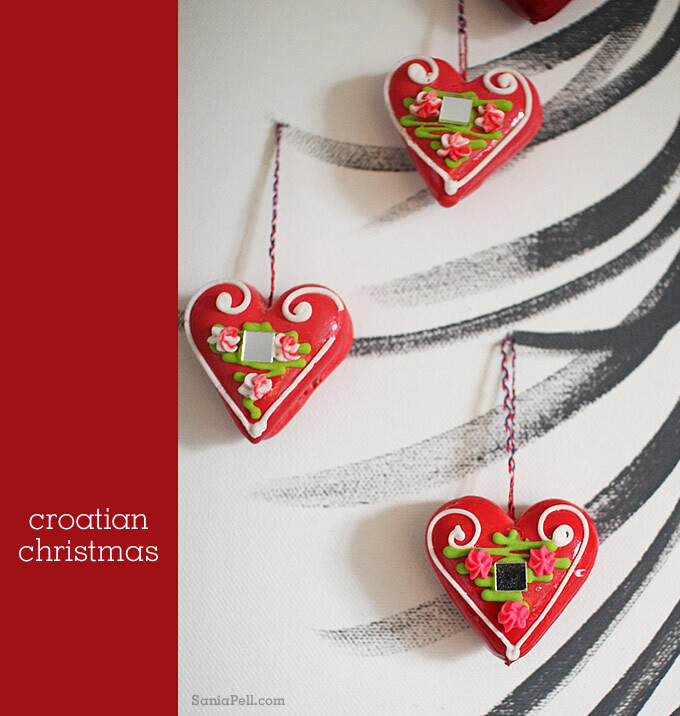 Every year I decorate my tree in a mixture of these charming handmade Croatian decorations called ‘licitar’. This year is no different with the children helping me to hang them, carefully placing the galloping horses around the bottom branches of the tree. The top of the tree, where the children cannot reach, is hung with the smaller hearts, all slightly different, bought and collected over the years as our trees have grown to fit the spaces we live in. I have bought more of these gorgeous decorations every time I visit Zagreb. They remind me of my childhood too. We always decorated the tree on Christmas Eve to the sound of Croatian carol singing and these decorations are unique to the Zagreb area. I love their homemade, naive and folkloric quality and I have not seen anything quite the same anywhere else. 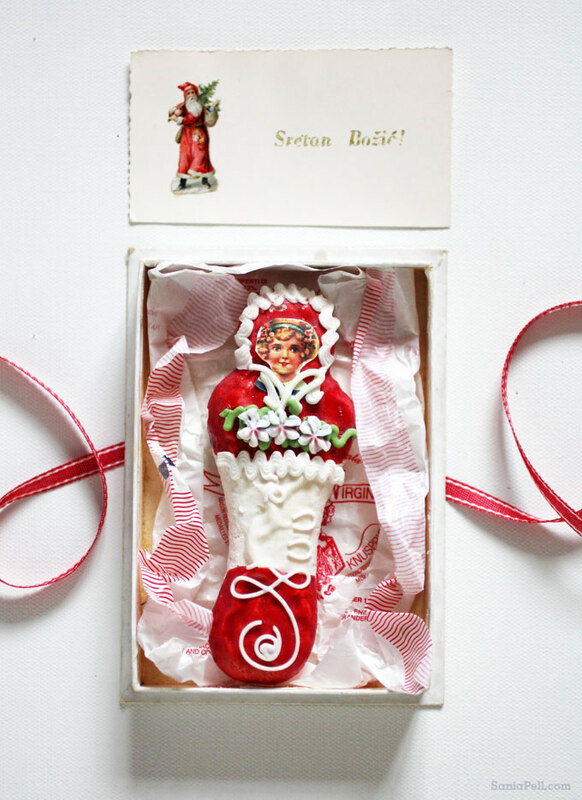 They are made from a type of honey dough, dipped in a red glaze and intricately decorated with fine piped icing, mirrors added for a little sparkle and sometimes a touch of découpage too. 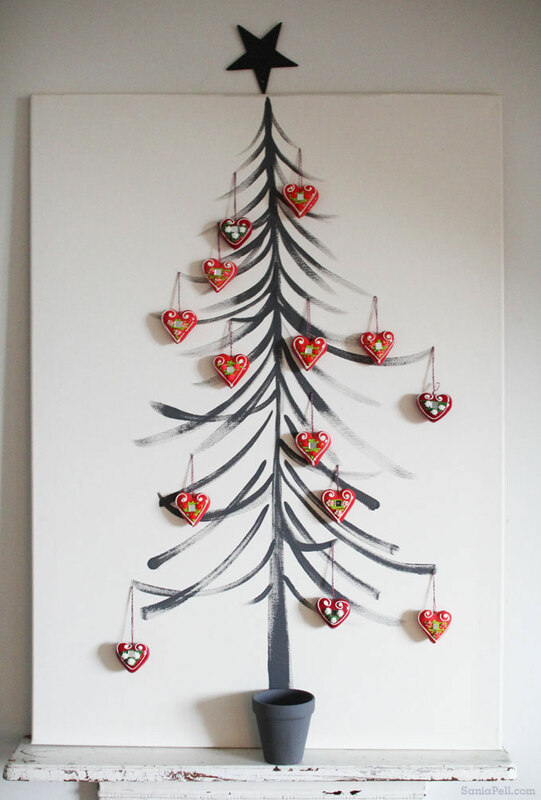 I painted this freehand Christmas tree on to a blank canvas for a bit of fun and to make it a feature. They can be bought in various shapes and sizes such as hearts, horses, horseshoes, boots, birds, cherries and wreathes, and although they are sometimes referred to as gingerbread they don’t in fact contain any ginger. Amazingly their origin dates back to the 16th century where decorated cakes were made in convents, in intricately carved moulds, and were sold in fairs and church festivals. 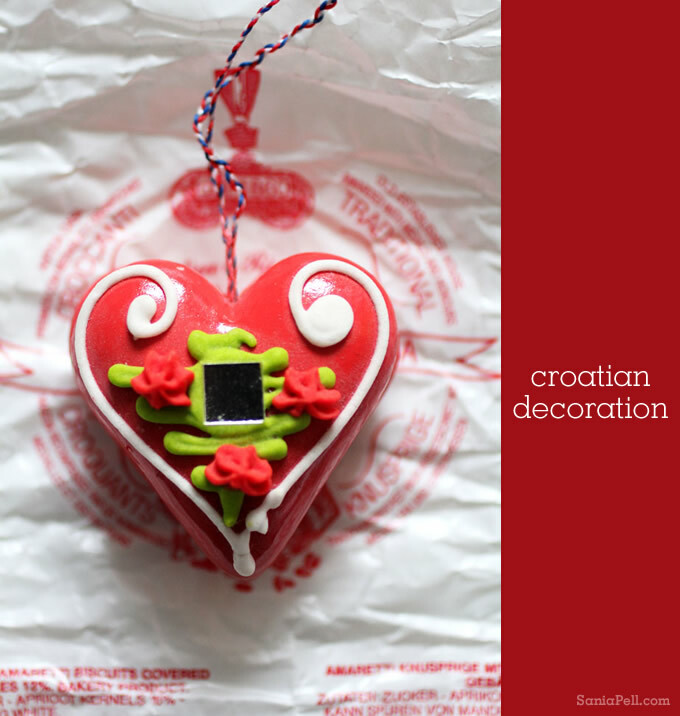 In 2010 this style of Croatian craft was added to a UNESCO heritage list in order to help preserve its cultural significance. 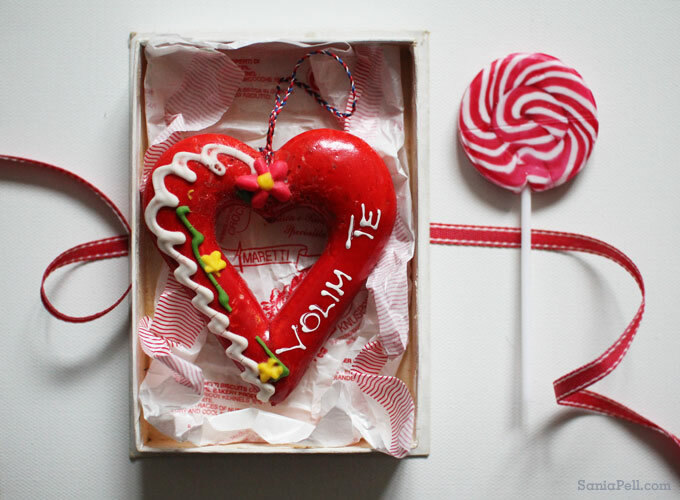 Nowadays the heart shapes are also given at Valentine’s Day and ‘volim te’ means ‘I love you’ in Croatian. You can have a go at making your own if these inspire you, it shows how they are made here and you can buy them direct from Zagreb here. I hope you like them as much as I do, they really are one of my favourite things. 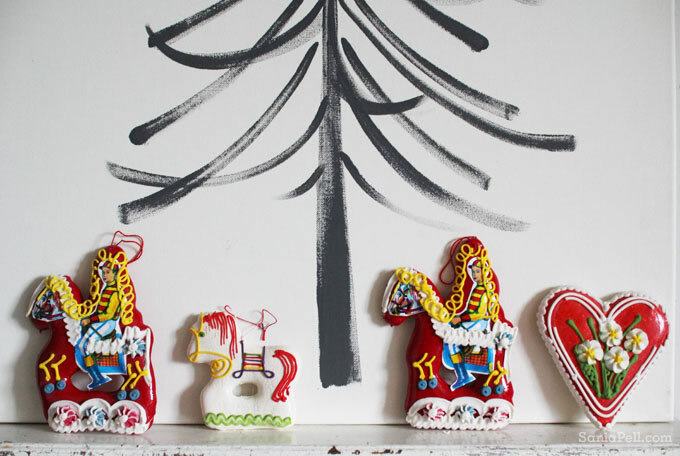 I had the pleasure of being asked by Grazia magazine’s Rachel Loos to be part of their Christmas special, in a feature on their favourite bloggers’ crafty Christmas ideas. 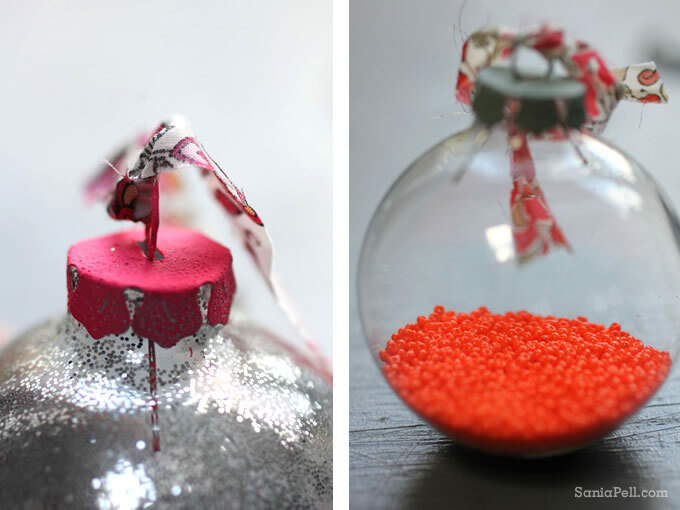 I was asked if I could come up with and create a bauble idea and, as is my way, I created lots of variations of the same idea for the photo shoot and thought I would share them with you. I worked with photographer Chris Tubbs on the shoot for the magazine but I also I took a few snaps at home that you can see below, they are so easy to make why not give them a go yourself? 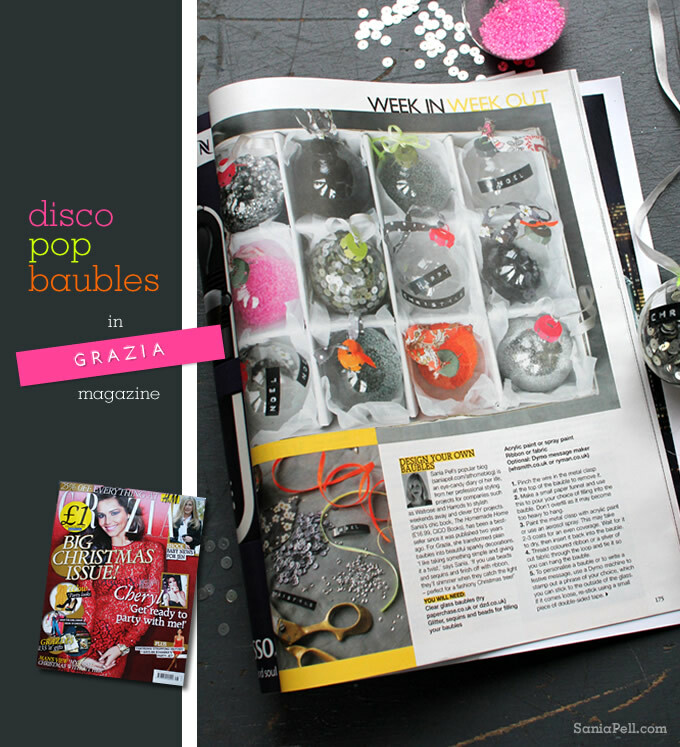 As it was Grazia, I wanted to break away from the traditional Christmas colours and give my baubles a fashion edge as well as a seasonal feel. 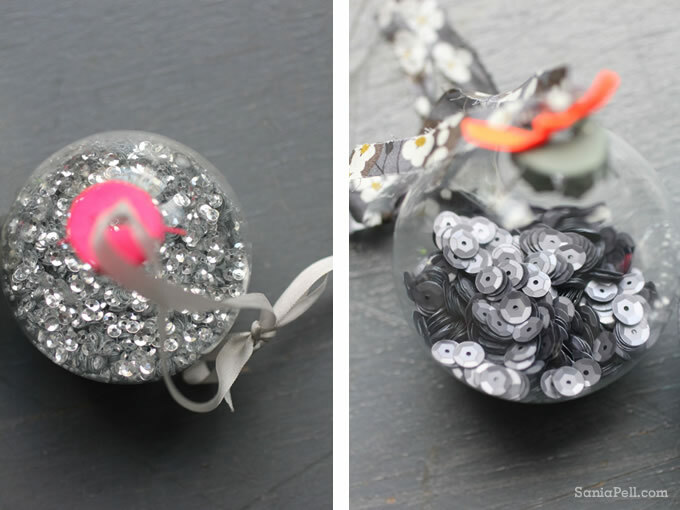 Using basic plain glass baubles as my starting point I combined disco sparkle in the form of glitter and sequins in silvers and greys, with Pop-inspired fluorescent neon paint and ribbon made from strips of some of my favourite fashion fabrics by Liberty. 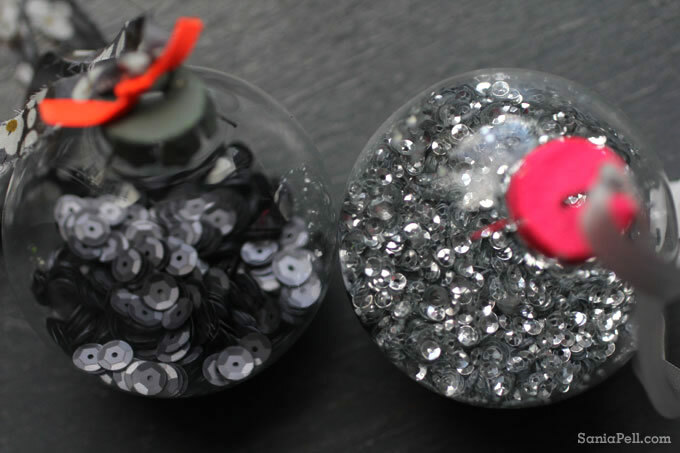 In others I tipped tiny beads topped by ribbon from VV Rouleaux and applied embossed black and white messages giving them a kind of disco/80s/punky feel. 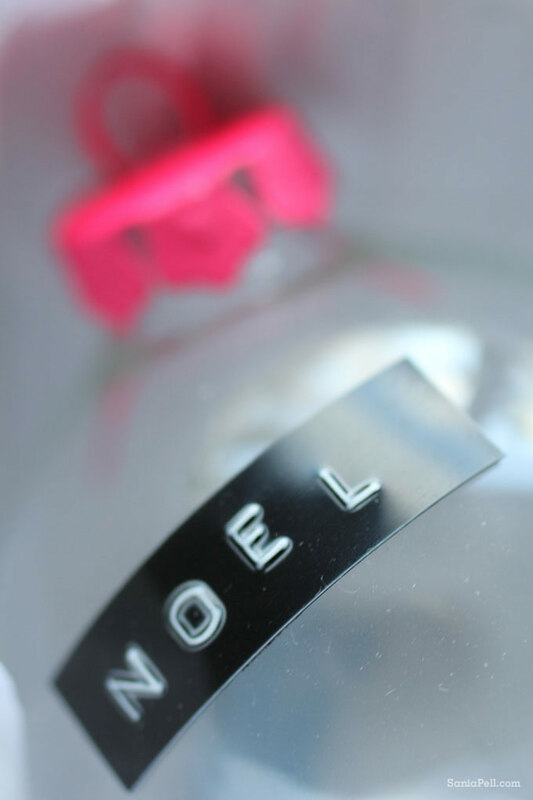 The Dymo message tape and labelmakers can be bought from places like WH Smiths and is a fun way of encorporating messages on all sorts of things like labels for jam jars of collected treasures or name tags on gifts. 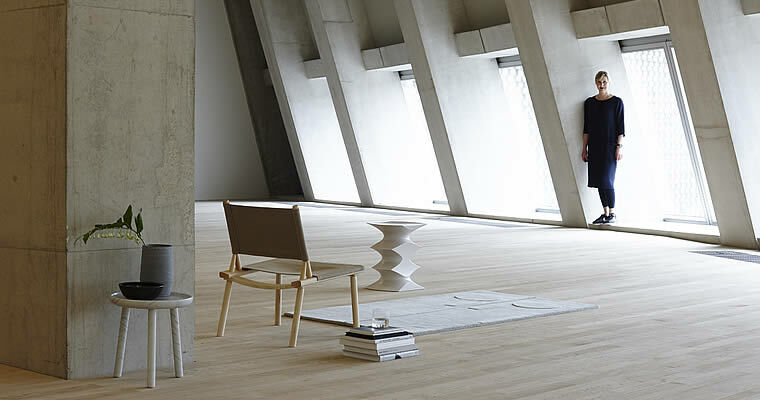 I was quoted in Grazia saying “I like taking something plain and giving it a twist” and that is really my approach to making and creating as well as for interiors and styling. 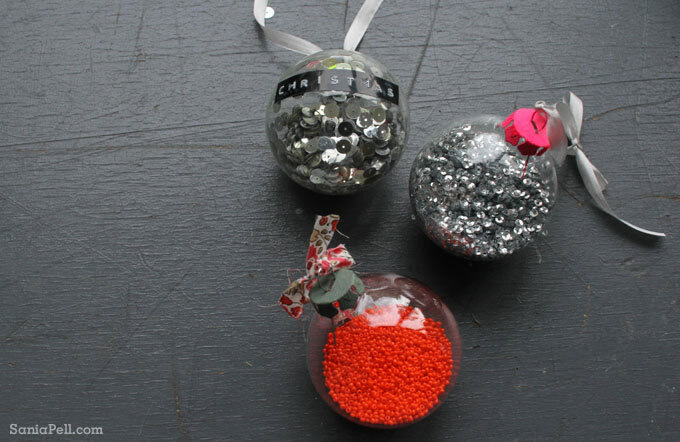 The great thing about making your own decorations is you can choose colour combinations that work with your Christmas theme and interior style, and change things around each year if you wish. 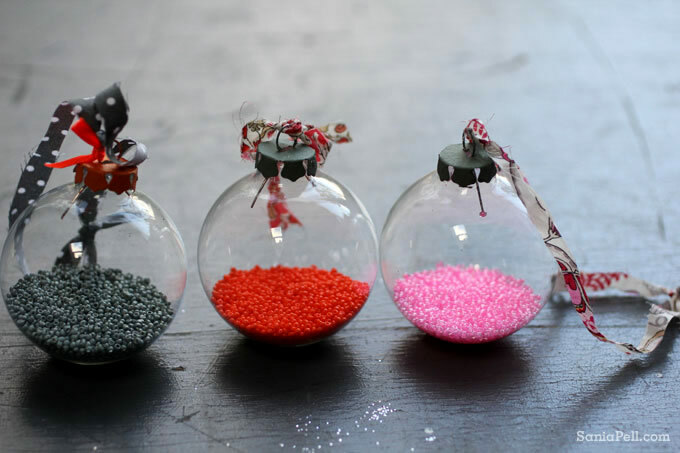 With plain glass baubles you can use whatever beads, sequins and ribbons you have to create unique and personal decorations that will catch your guests’ eyes when they visit over the festive holidays. 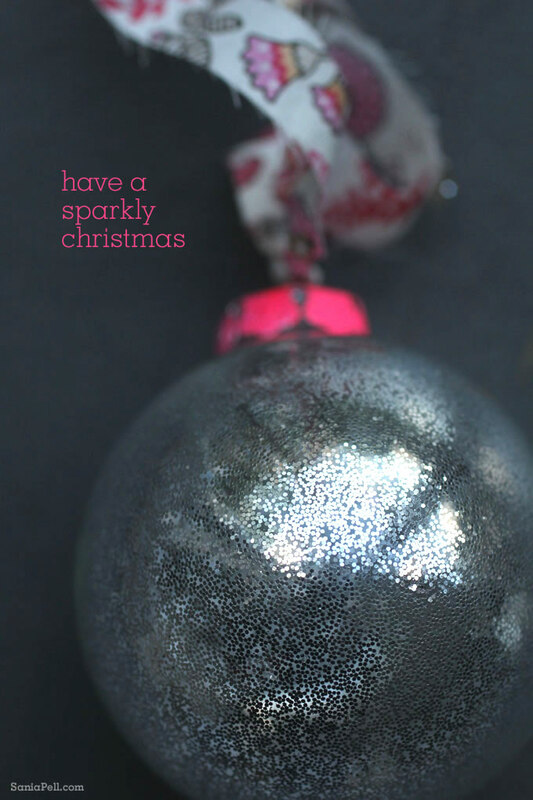 Have a lovely Christmas everyone. 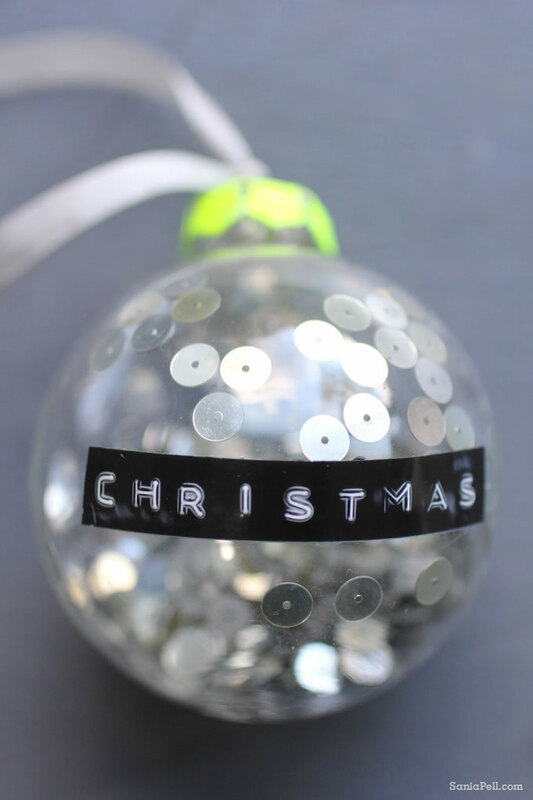 If you like this idea have a look at my bauble ideas from last Christmas and my sequin disco vase idea that I posted when I first started this blog. If you’ve followed my blog since the early days you may know I help each year with my children’s school Christmas fair since my son first started nursery, and this year was no exception. Being part of the school community is a wonderful thing. When the children were little and I stayed at home and looked after my baby daughter, helping at the school gave me a creative outlet and contributed to a community that helped all the school children. Now my children are both at school and I am working much more I have less time to help, but this year I still managed to make a few items for the fair in evenings and spare moments which we sold on the gifts stall at the fair last Saturday. I snapped a few photos in my kitchen of some of the things I had made and thought I would share them. 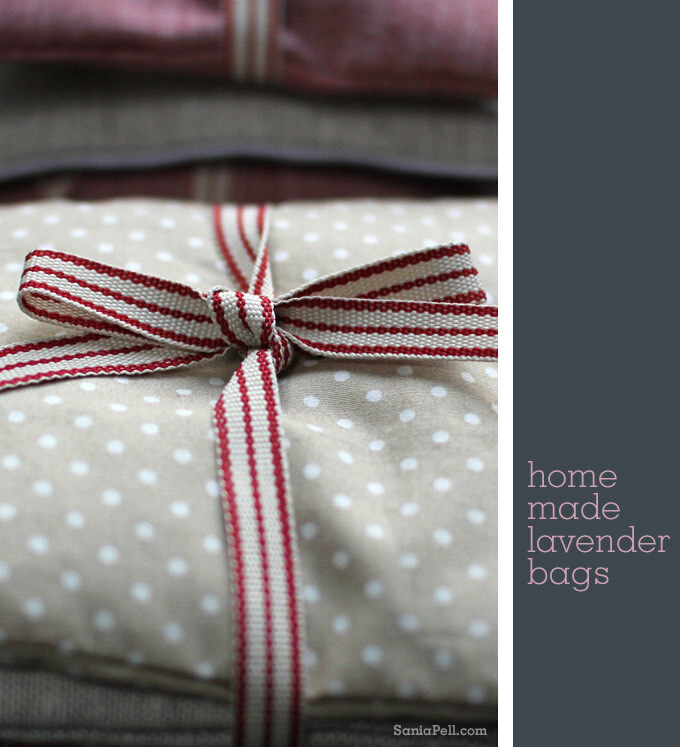 Lavender bags are always popular, you can’t help but smell them when you pick them up, and however many we make (and between us we made almost 100 this year), we sell every single one. 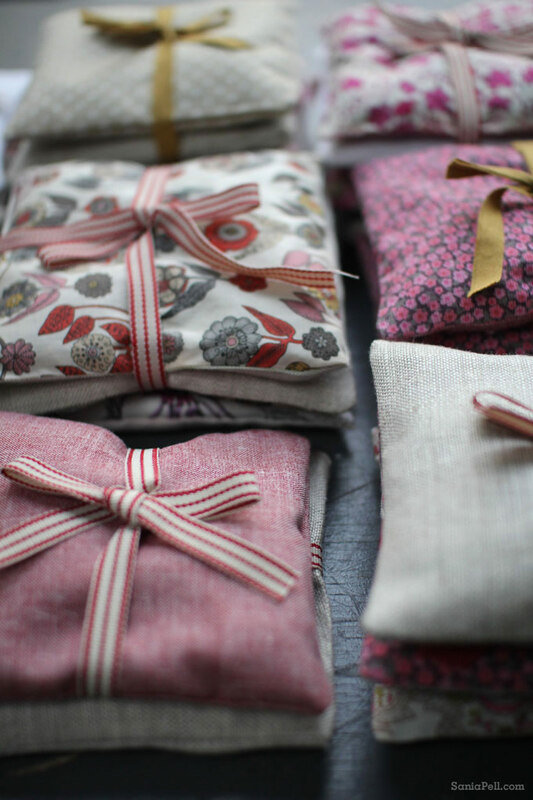 We sold them as singles or double packs in linen and Liberty print fabric, with a ribbon tied around them. They’re simple to make even if you have basic sewing skills and there are how-to instructions in my first book if it feels daunting. 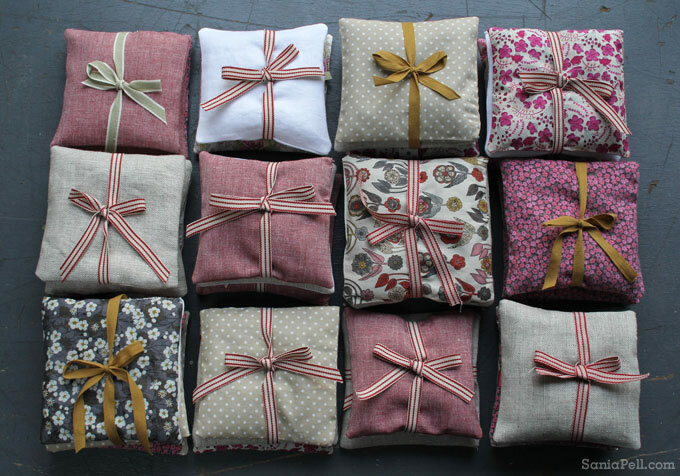 I posted about lavender bags as a great mother’s day gift back in March (see post) but they are perfect Christmas gifts too. 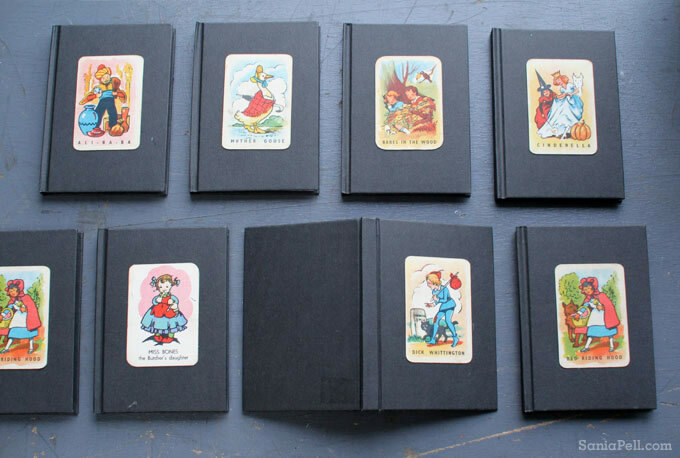 These little black notebooks were bought from my local Tiger store and I just added some vintage playing cards, bought from a car boot sale, to the front covers with double-sided tape. 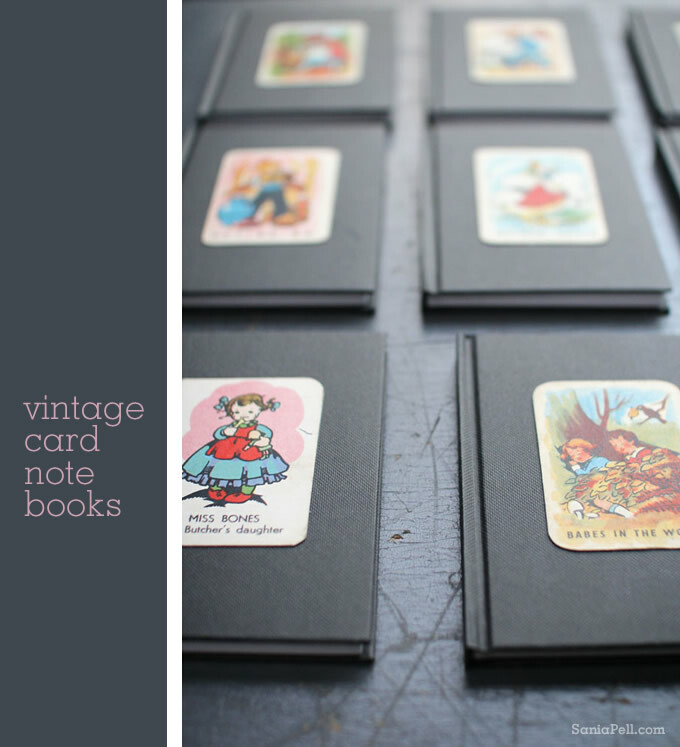 These are a simpler adaptation of the notebook project in my latest book (see my previous post). Great as a stocking filler with a little pack of coloured pencils. 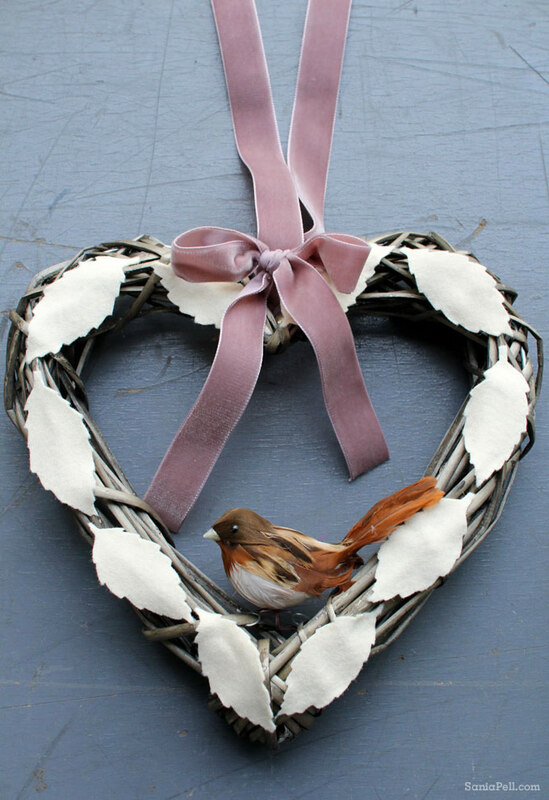 The festive wreaths below are another popular item and look fab hanging from your front door or inside your home. 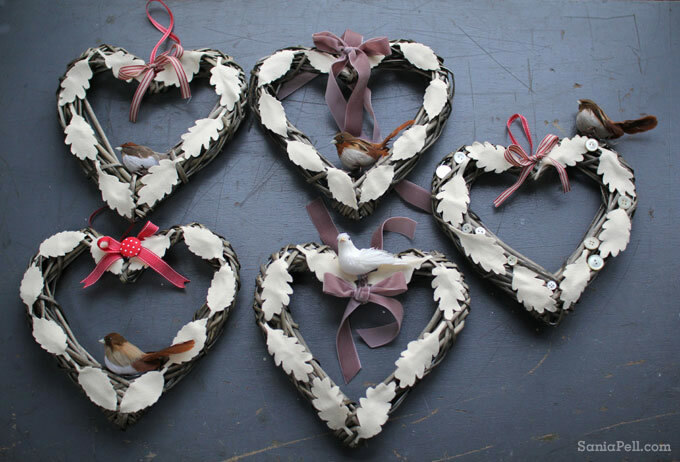 This year I bought heart-shaped basic woven wreaths and decorated them with felt leaves that were cut out and stuck on. To do this pin a real leaf from a tree to your felt and cut around it as accurately as possible. 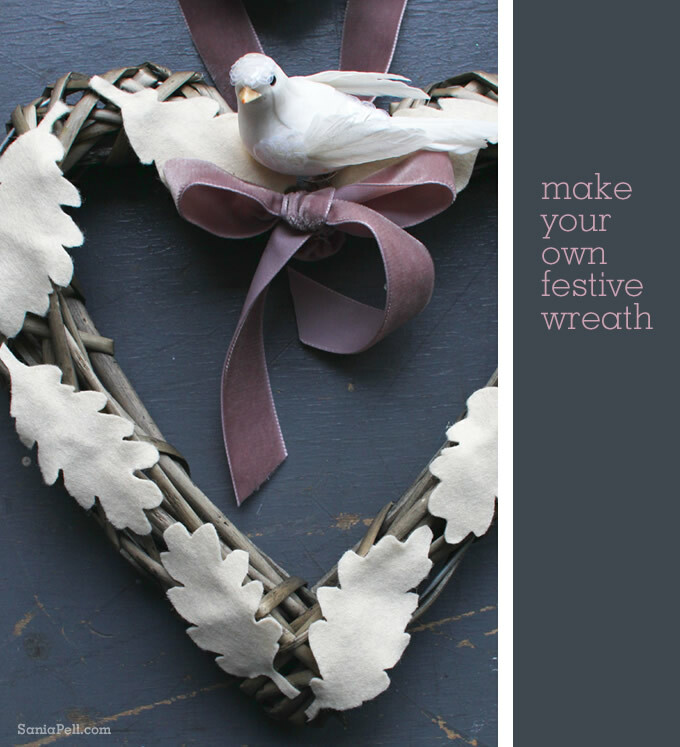 I embellished with ribbons and covered buttons at the top of the wreath and added little birds from DZD. To see another variation of this project see my post with instructions from last year here. Lots of parents helped and we also made lots of other items like hair clips and bands, embellished cushions, decorations, jars of sweets and lots of gifts donated by local companies and parents. It was a successful day, we raised money for the school but most importantly it was a lot of fun for children, parents and teachers to all get together on the same day. Now it’s time to get back to planning our own family Christmas! 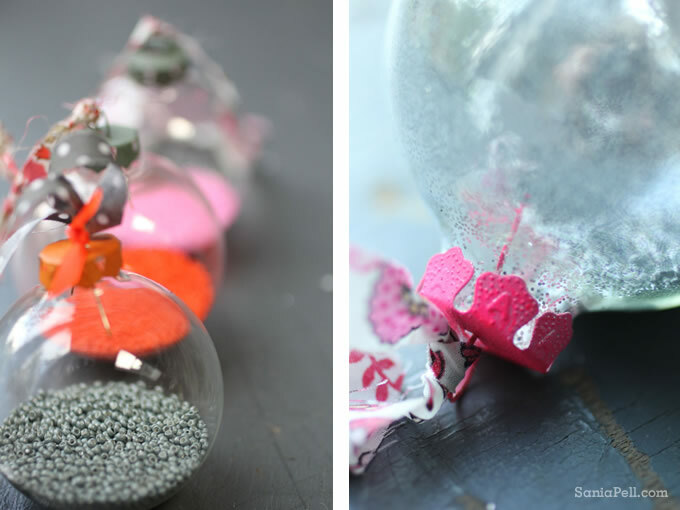 Time is ticking along and there are now three gift-making weeks until Christmas so it’s the perfect time to get creative. There is nothing quite like a homemade present, made and given with love. 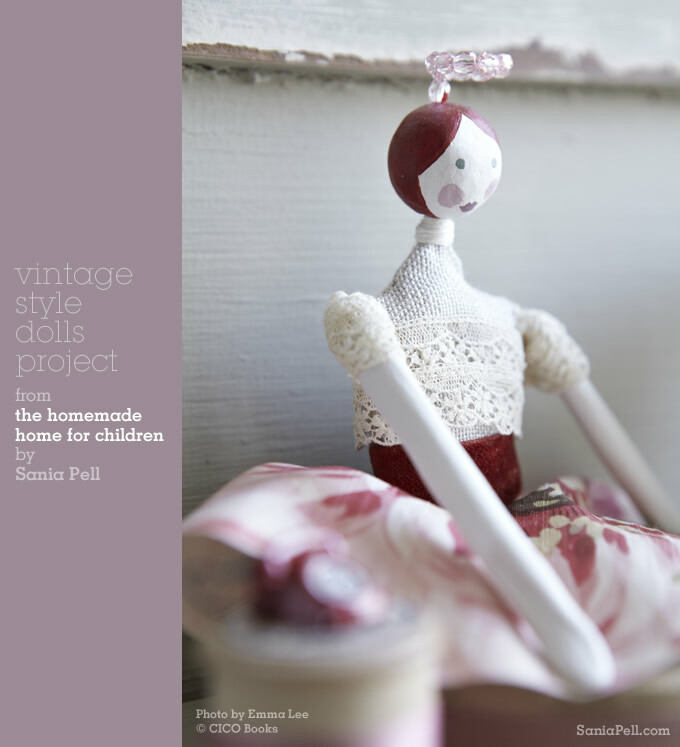 My latest book The Homemade Home for Children – 50 Thrifty and Chic Projects for Creative Parents was released earlier this year and it got me thinking as to which projects from it could be made as Christmas gifts. 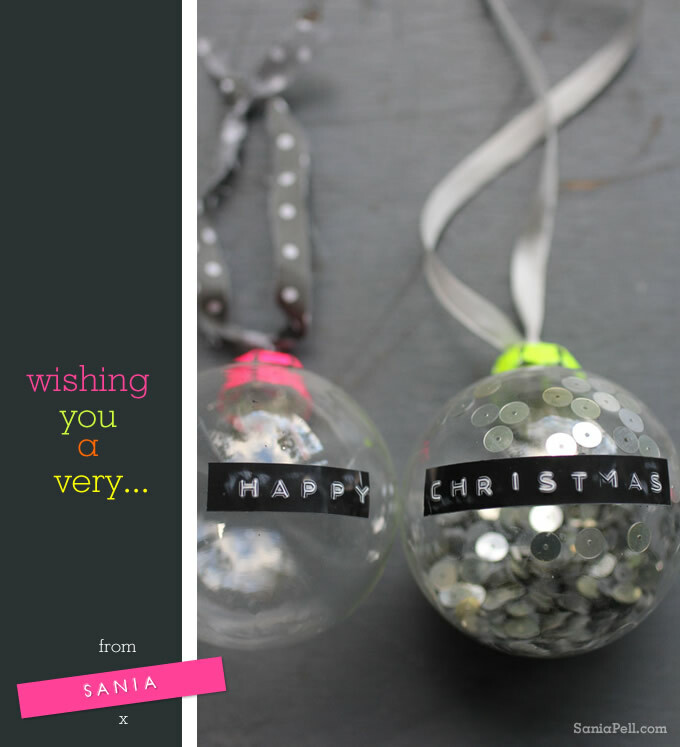 Here are a few of my favourite projects that would make great festive presents. 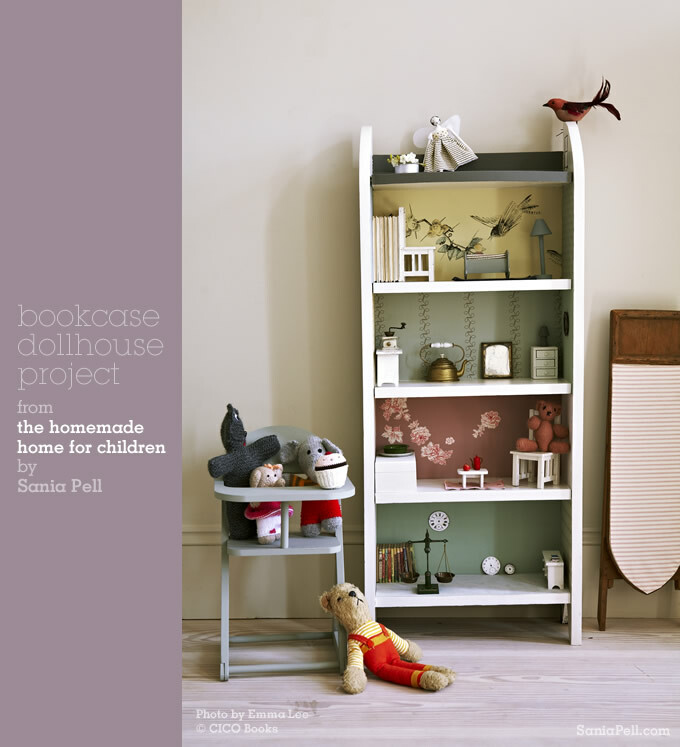 This bookcase dolls house is a favourite of my daughter and her friends when they come to play. It’s fairly simple to make but needs a bit of time and would make every little girl happy to receive it. 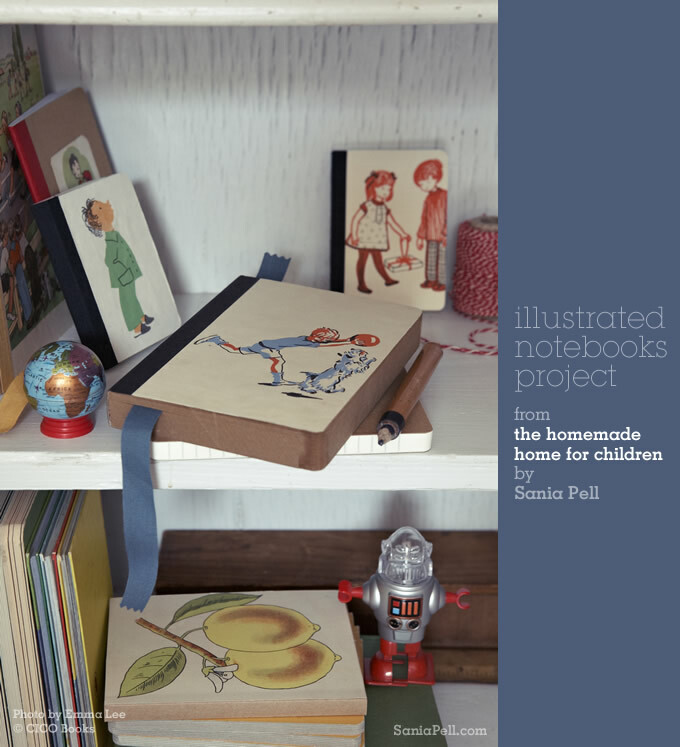 There are full how-to diy instructions for all of these projects in the book. 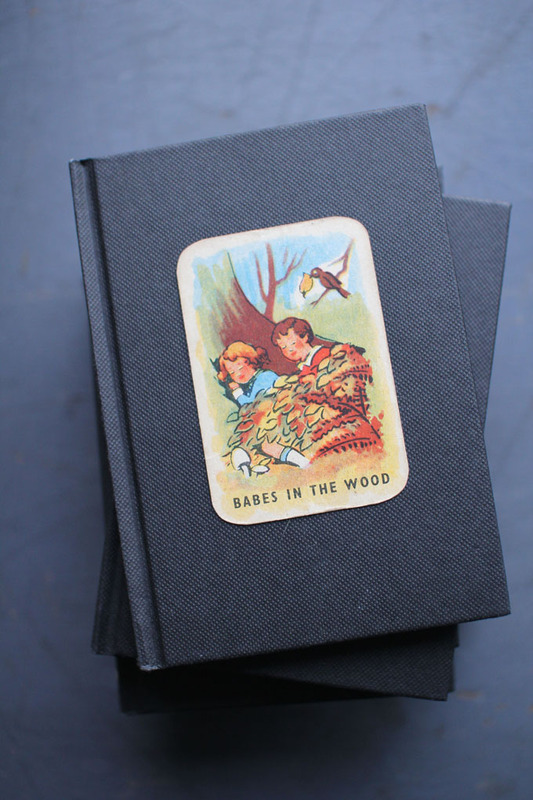 Theses notebooks are quick and easy to make and would make a great stocking filler that encourage drawing and writing. 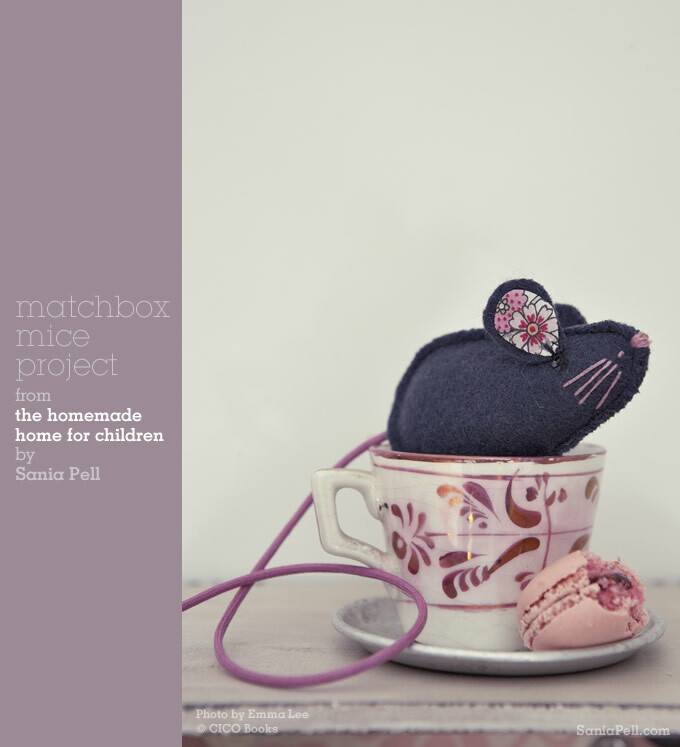 These little stitched mice are cute and the book shows how to make a matchbox mouse house to go with them too. My book includes a template to photocopy for the shape of the mouse and step-by-step instructions. 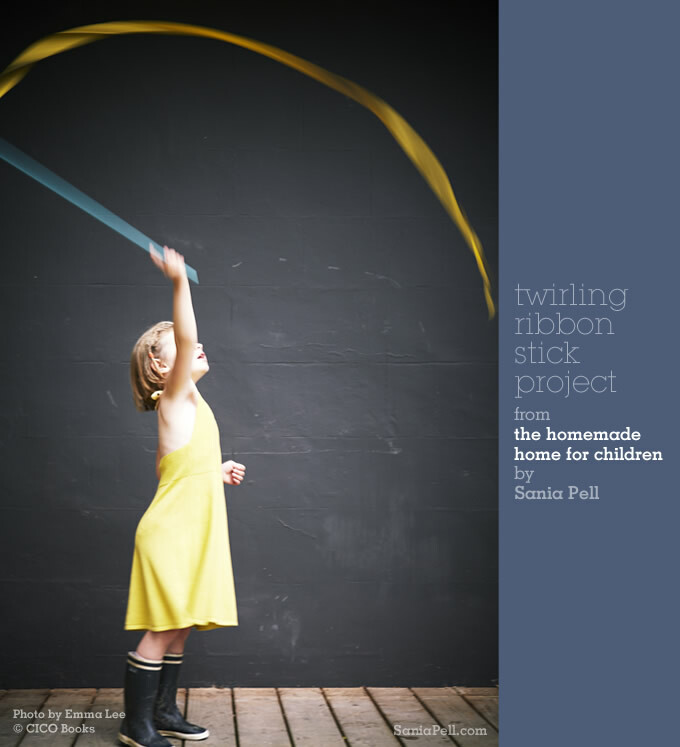 These twirling sticks are as much fun for boys as they are for girls (that’s my daughter in the photo) and they are super easy to make. The dolls below are a more special gift, something for a little girl to cherish and keep forever, passing on to her own children one day. I made several variations of doll in the book including a football version that is great for boys too (my son loves his!). It was my children’s school Christmas fair this weekend and, as in previous years, I made lots of items to sell on the gift stall to help raise money for the school. Most of them are twists of projects from my books and I took some snaps before they were sold which I will share on the blog soon. I hope these images inspire you to have a go making gifts for children, family and friends, or if you don’t have time to make, you could gift them a copy of one of my books so that they can make some of the ideas for themselves – there are 45 more projects like these in the book! 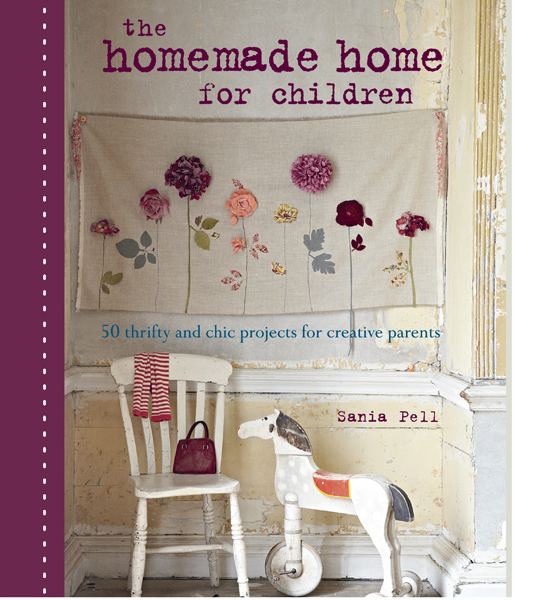 The Homemade Home for Children is published by CICO Books and available now at Amazon UK and Amazon US. Photographs by Emma Lee, courtesy and © of CICO Books.